If you want to start your own business yet you do not know where to actually start then why not consider investing in a BBQ and grill cleaning business in Maine? Do not hesitate about how you can potentially earn from this type of business because it does not entail any high startup cost nor does it require years of experience to be able to grow one. All you need is patience and hard work to be able to reach out to residents within Maine and you are good to start. Remember that we are not a franchising business which means that you do not have to pay monthly or annual royalty fees. We have also been receiving a lot of service requests from residents in Maine in the past but we are having a hard time reaching out to all of them. We need you to help us market this service to clients who are willing to pay for BBQ and grill cleaning services. You can work at your own hours too and charge fees according to the services you render. We will assist you as you start your BBQ and grill cleaning business and ensure that we will walk you through the entire process throughout your business’ lifetime. Why Start a BBQ Cleaning Business in Maine? Weather is Great for Outdoor Grilling: Maine is known for having comfortable summer climates. This allows flexibility when desiring to grilling food outdoors. Likewise, winters are not too cold which means that there is potential to offer your grill cleaning services all-year long. Large Number of Potential Customers: Many of the residents in Maine have their own grills at home which mean good news for your business. Only a Few Competitors: There are many other types of businesses that you can consider investing in but competition in these niches can be very tough. With the BBQ and grill cleaning service, you will only have a few competitors. Grow Your Business When You Want: Hire more staff to help you or add more vehicles to your fleet in order to meet the demands of clients whenever needed. How Does The BBQ Cleaner Help You Get Started in Maine? Our all-in-one package will definitely help you get started but apart from this, we also provide on-going lifetime business support from The BBQ Cleaner so that you can grow your business successfully. Since our inception in 2009, we have grown our operations with the help of over 180 operators nationwide. We are also considered a leader in the BBQ and grill cleaning industry thus you can be sure that you will easily unleash your full earning potential. 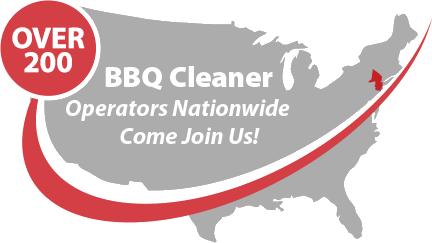 Talk to us today to find out more about this stellar BBQ cleaning business opportunity in Maine!